The Big Explosives Experimental Facility (BEEF) is a hydrodynamic testing facility, located at the NNSS, about 65 miles northwest of Las Vegas. BEEF provides data, through explosive experiments, to support the Stockpile Stewardship Program, along with a variety of new experimental programs that expand the Nation’s non-nuclear experiment capabilities. When the DOE’s Lawrence Livermore National Laboratory (LLNL) facility in Livermore, California, was no longer permitted to perform large, high-explosive experiments at the facility due to community encroachment, a new site had to be identified. Fortunately, an ideally configured location already existed at the NNSS. The existing site consisted of two earth-covered, two-foot thick steel reinforced concrete bunkers built to monitor atmospheric tests at Yucca Flat in the 1950s. LLNL moved its high-explosive experiments to the NNSS and BEEF was established in 1994. The facility consists of a control bunker, a camera bunker, a gravel firing table, and associated control and diagnostic systems. 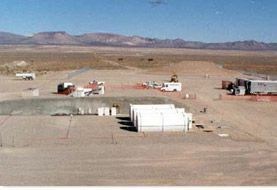 The facility safely conducts conventional high-explosives experiments using a test bed that provides sophisticated diagnostics, such as high-speed optics and X-ray radiography on the firing table, while operating personnel are present in the bunker. WATUSI is one of the largest activities conducted at BEEF by Los Alamos National Laboratory. 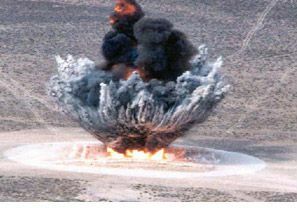 The 36,600 pound TNT-equivalent, research and development activity was designed to validate low-end detection capabilities associated with ground motion and the acoustic footprint of an explosives detonation. Before large conventional high-explosive experiments could be conducted on the site firing table with operating personnel present in the control bunker, it had to be certified as safe. To achieve this, scientists conducted “Popover”—a series of high-explosive (up to 7,800 pounds) tests which were detonated 27-feet from the bunker’s buried outer wall. BEEF plays a significant role in accumulating data to support the Stockpile Stewardship Program. Scientists conduct weapons physics experiments, using high-explosives and pulsed laser power, to study and investigate impacted materials as they are merged together by the detonations. Additionally, the programs exercise the design and experiment skills resident in the primary development groups at the national laboratories. These will be required for the execution of future stewardship and management missions. As with other NNSS experiment programs, continued operation of BEEF will aid in maintaining nuclear test or experiment readiness. These activities continue the work begun during the nuclear testing era.